What do a New York heiress, a dot-com millionaire in San Francisco, and the team leader of a CIA counter-terrorist project in Los Alamos have in common? They are all murdered on the same day within an hour of each other, and in each case, the police have no idea who might have done it. In Scorpio Rising, author Alan Annand gives us a screen-scroller of an e-book crime story (also available in page-turning paperback) with a protagonist for the modern age. Axel Crowe, a criminal profiler from Toronto, works his magic using Vedic astrology, palmistry, and other esoteric means that can either raise eyebrows or pique interest. Crowe’s investigative tool-kit and spiritual devotee background provide a unique and alluring protagonist. Through Crowe, we gain a glimpse into the mind of a professional astrologer at work as he investigates the killing of the New York heiress at the behest of her brother. Crowe manages, by plotting charts, following signs, and reading the odd print to figure out that the three murders are connected. How Crowe manages to convince the police, figure out the connections, and track down the killers, coupled with Annand’s knack for upside-the-head metaphors, provide the incentive to keep reading long past any reasonable bedtime. Scorpio Rising pays homage to Alfred Hitchcock’s Strangers on a Train, the story of two men who meet in the bar car of a train and agree to kill for each other, thus establishing perfect alibis. 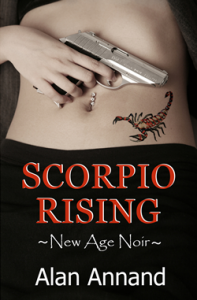 In Scorpio Rising, the question really isn’t who done it. We fairly quickly know who did it. The big question is, how did it come to this? Annand takes us along for the ride with the killers in two of the three murders, making them relatively sympathetic, until we realize where we’re going and what we’re doing, though it’s not like we didn’t already suspect something was up. It is, after all, a story about multiple murders. Most of the characters jump off the page, though the copious use of alliterations for proper names seemed unrealistic until I remembered the name of the author. But I found myself, more than anything else, anticipating the next chapter that featured Crowe, as watching him work was one of the most enjoyable aspects of the book. According to Annand, who agreed to an interview with Val Tobin about his book, Crowe is a “consummate professional who is a master of his arcane craft, a moral man bent on pursuing justice in the service of his clients … ” Crowe’s personality, values and morals make him seem real, and Annand acknowledges that the character was based on some real people, himself included. Annand has poured a lot of himself into this book, and it would seem he shares a fanatical attention to detail with his protagonist. Alan Annand has five published novels to his credit and has produced two children’s animations. He contributed articles to a variety of astrological magazines. He lives in Toronto, where he divides his time between his writing and meeting with clients and giving classes on palmistry and Vedic astrology. Annand has practiced astrology for 30 years (with about half of those years dedicated to Vedic astrology) and palmistry for more than a decade. He speaks at astrological conferences and New Age gatherings, and has appeared on CBC and CTV. He was also a guest on several radio programs. Scorpio Rising does for astrology what the Da Vinci Code did for art history, or what the Indiana Jones series does for archaeology. If you enjoy a good crime story with a protagonist who gives you a unique glimpse into a specialized field, then this book is for you. The rapid pace and constant tension will please thriller fans. Even if you doubt the veracity of some of the tools Crowe uses, you will no doubt find his investigative process fascinating. Readers will be seeing more of Axel Crowe in Annand’s novels Felonious Monk and Soma County. Annand, Alan. Scorpio Rising, Toronto: Sextile.com, 2011. Sextile (Accessed September 19, 2011). Annand, Alan. Navamsa (Accessed September 20, 2011). Nadiya Shah Productions Interview Part I (Accessed September 19, 2011). Nadiya Shah Productions Interview Part II (Accessed September 19, 2011).